A quiet approach helps to bring you closer to nature. Cycle through the unique natural landscape of Svartådalen (The Black River Valley) and experience a truly unspoilt natural environment. The sights, sounds, smells and tastes of nature will stay with you long after your departure. 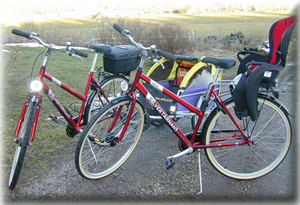 Edens Garden is located directly on the regional bicycle route called “Mälardalsleden”. This is a cycle route totalling over 600km around Lake Malaren; Sweden’s third largest lake at approx 120km wide! This route also connects with the longer national cycling route through Sweden called “Sverigeleden”. Svartådalen is perfect cycling country. The local rural roads are amazingly traffic-free compared with most of Europe. Turn off the roads and you have access to a huge network of gravelled forest roads and tracks. Charming and undisturbed, it is a real delight for the amateur cyclist. Our modern bikes have 7 hub gears, a lockable storage box, lights, rugged tyres and come with helmets. We also offer a “Burley bike trailer”. Suitable for two small children (max total weight 45 kg) at 75 SEK per day.